HSDiagnomics was founded in late 2012. Inspired by several years of research about T-cell receptors and the enormous possibilities of modern Next-Generation-Sequencing plus tailored bioinformatics tools we came to the conclusion that our protocols and methods for target specific amplification of TCRbeta loci from genomic DNA samples provide a key to profiling and understanding of the adaptive immune system. With our proprietary TCRsafe™ technology, which we developed carefully over the last 2 years, we believe that even large-scale screens on TCRbeta profiles under various conditions can be carried out in a robust and quantitative way, without risk of carryover contamination. HSDiagnomics offers a fully integrated service to its customers, which opens new possibilities for all scientific and R&D projects investigating the role of T-cells under diverse conditions (treatments, vaccination, diseases, etc.). With our experts and technology at hand our customers will save time, budget and staff resources, since there is no need to set up and evaluate primer systems or develop dedicated software solutions. Within days we can deliver results, which bring you directly to the real important questions. While TCRsafe currently covers the human TCRbeta locus in its total complexity, we are working on an expansion of the system to human TCRalpha and to the murine TCRbeta, which we expect to be available early in 2015. Carryover of DNA as a source of contamination can be a serious problem. 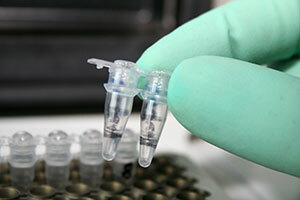 TCRsafe™ avoids contamination from the first sample on, even spurious amounts of foreign DNA will be eliminated. The complete IMGT nomenclature is used in our annotation of TCRbeta sequences, every known V/J-segment is addressed by our primers. Our primer mixtures are thoroughly calibrated by use of a proprietary reference template set. This is an important feature, since in a multiplex set-up of 44 (V) versus 14 (J) primers it is a non-trivial task to establish even amplification rates of all possible V/J-combinations. An in-house developed and carefully tested bioinformatics package does all tedious steps from processing of raw sequence pairs up to sophisticated clustering and frame analysis of CDR3 sequences. HSDiagnomics continuously works with partners from Charite/Berlin and University Hospital/Erlangen to improve and extend its technology. We are always interested in cooperations with academia or R&D teams!